When after my first ever talk in Bratislava at ELTforum in June, 2013, I was offered an idea of giving a plenary speech some time later, my first reaction was a mixed one: I was surprised, I was pleased, I was scared, I was excited and, at the same time, I felt very humble. But I could never imagine that I would give a plenary this soon, just a couple of months later, in Preveza. So, up till now, I have given two speeches: a so-called concurrent talk and a plenary talk. Not so many, but enough to draw some conclusions. And here, in this post, I would like to share the lessons I have learnt from my experience as a presenter. For some, there isn’t much difference between a concurrent talk and a plenary because in both cases you might find yourself talking to a large audience (this was my case in Bratislava) and/or your talk might be recorded. Thus, it may look like it doesn’t matter what you call your presentation – a concurrent talk or a plenary – its format might appear pretty much the same. a plenary talk’s content and format should appeal to people with various interests and perceptual styles. So, it’s not surprising that a plenary speech presents the biggest challenge. I’ve accepted it. Whether I succeeded or not – I don’t know, this is what should be decided by people who listened to me. But no matter what the outcome was, here is what I have learnt about dos and don’ts of a plenary speech. A plenary should never ever look like a report to your boss on what you have accomplished. I have got some suspicions that my plenary talk in Preveza nearly turned into a sort of report but thanks to a lucky chance that I was asked to stop 20 minutes earlier than planned, I avoided this trap. A plenary should always be informative, communicative and entertaining. To quote from Max Atkinson (link): “Speeches and presentations have a tremendous capacity for boring audiences out of their minds, and […] holding the attention of the audience is a major challenge for speakers.” So, the longer your talk is, the more difficult it is to keep your audience with you. Considering the fact that most plenary talks last for about 60 minutes, the speech should be a balanced mixture of information, communication and entertainment. The proportion in which you mix these three ingredients depends on many factors such as the topic, the settings, the purpose of the talk, the personal presentation style of the speaker etc. And this is the presenter who decides how to combine all three in his/her speech. The point I would like to make in connection with this “rule of three ingredients” is that communication with the audience and the delivery of speech should be smooth and flawless. And both should be well thought-through and well rehearsed. Just recently I picked up a useful tip on how to practice your speech so that, on the one hand, it was well-rehearsed and, on the other, it looked natural and was flexible enough to be adjusted to any unexpected situation that may arise during a presentation. According to Jezra Kaye (link), most speakers practice by starting reading or delivering their speech at the beginning and plowing through the speech up to the end. This “plowing throw” might not only stiffen your delivery of speech but also make it harder for your audience to follow you and stay tuned in throughout your talk. To make things worse, the practice of rehearsing from the beginning to the end may also make you unprepared for various unexpected disruptions and changes when you are actually delivering your speech. Jezra Kaye suggests using a different approach. She says: “You’ll handle all of these less-than-ideal scenarios better if you’ve practiced your speech flexibly, section by section.” (link) She also recommends that you choose a random section of your speech and practiced it leaving other sections for other days. 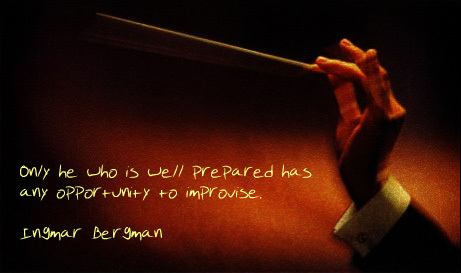 As your confidence grows, you may start practicing several sections together. Also, you can try rehearsing your talk backwards: from the last section back to the first one. The last thing I want to say in connection with delivery of a plenary speech, and in fact, any speech or presentation, is that real things around you may become real obstacles! A stage you are standing on may make you look too authoritative and distant which can disrupt your communication with your audience. A table between you and your listeners might turn into a fence. The projector may be positioned in a way that whenever you want to move around the stage you screen off the slides. And so on and so forth. These minor nuisances may haunt you like a mosquito at night, making you feel uncomfortable and diverting your attention from communication with your audience. And like a chat with your best friends, your presentation, be it a concurrent talk or a plenary, should be meaningful, joyful and exciting for both, you and your listeners. This simple truth should not be forgotten. Pingback: Recap of Resources and Interesting Blog Posts – 26 December 2013 | Stop Complaining – Enjoy Teaching!